I made this little notebook for my craft fair tomorrow! I used the Winter Bright Simply Scrappin' Kit, and lots and lots of ribbon!! It's just your basic 3x5 pocket notebook--very simple to make!! Here's an up close shot of the ribbons. What a cute stocking stuffer, don't you think? Here is the November issue of "One Happy Stamper"! I am so sorry--I thought I had posted it already!! Have a great day!! And don't forget to sign up for my Holiday Helper newsletter--look to your left!! Please look to the left sidebar for the sign up form!! There will be two choices for you--the "Holiday Helper" list, as well as my regular customer newsletter list "Stamp with Tammy". 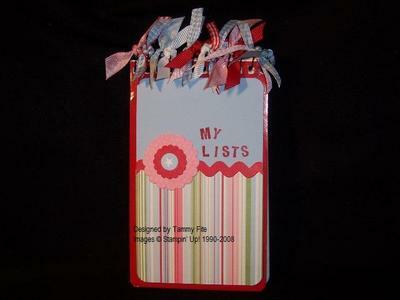 You will only be added to the lists you request!! Here's another matchbook treat. These had the little packs of Skittles inside! 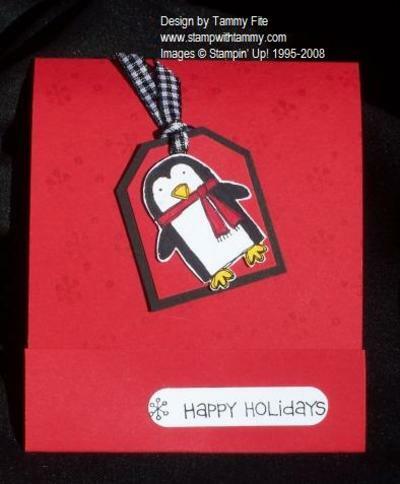 I used the Punch Pals stamp set on this one--I just love that little penguin!! Here is a cute little treat I'm making for my upcoming craft fairs. They are so simple to make--I start with an 8 1/2 x 3 1/4 piece of Brocade Blue cardstock. Score at 1" and 5". Decorate the outside--I used the Jumbo Snowflake wheel. I stamped the big word stamp from "Season of Joy" (only available thru Nov 30!!) in Real Red ink. 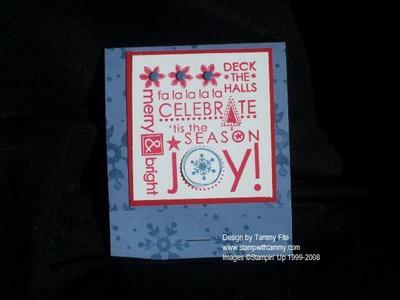 I then stamped it again on scrap paper in Brocade Blue, and punched out the little snowflake in "joy". 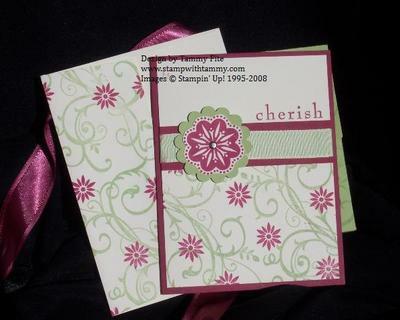 I adhered that with a Stampin' Dimensional. I added some Brocade Blue brads in the center of the flowers. 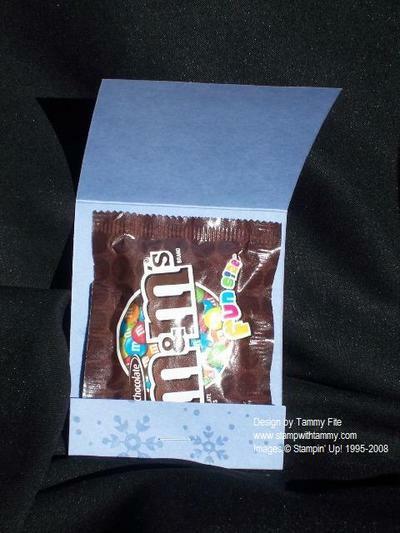 Then, you fold up the bottom flap, insert your candy and staple! The top flap will tuck into this small flap, like a matchbook!! Wrapping Up the Holidays Specials!! 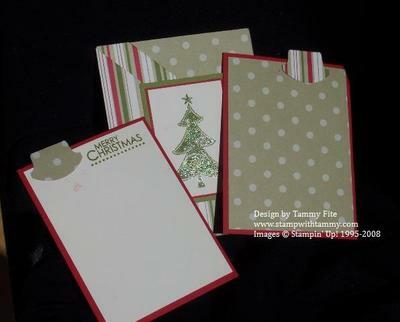 Holiday Tag Bundle (item 112409) A new item just for this promotion! This bundle includes several pre-cut pieces from the Holiday Glitz kit and makes 15 quick and easy toppers for gift giving. Empty Accents and Elements Tin-3 Pack (item 112410) A new item chosen just for this promotion! 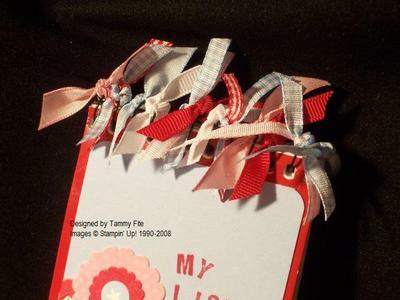 Tags for All Stamp Set* (item 110380) 20% off! Hand Selected Accents & Elements (item 110228) 25% off! 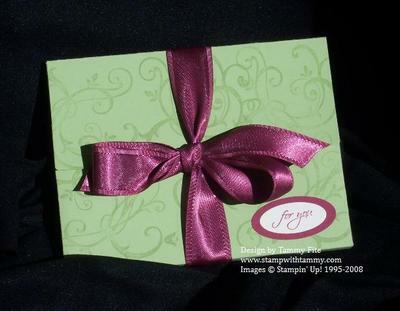 Designer Gift Cards* (item 110264) 30% off! Purely Pomegranate (item109863) and Chocolate Chip (item 109862) Satin Ribbon* Buy 1, get 1 free! This was our third stamp camp project! It's a 2-pocket card made from one sheet of the Dashing Designer paper!! Here are the inserts. One is for your written message, and the other is for a picture or coupon or whatever you'd like!!! This is a project we did at the Nov 3rd stamp camp! 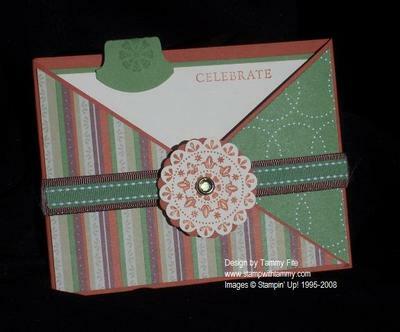 It's a criss cross card, made with the Wanted Stamp Set. This is really a versatile set--and best of all, it's masculine!! I'm always looking for great "boy" stamps!! Misc: 5/8" chocolate chip grosgrain, double stitched wasabi grosgrain, scallop punch, ice circle rhinestone brads, and the round tab punch. I hope this finds you all enjoying your perfect Thanksgiving!! I love this day--it reminds me that I have so very much to be thankful for: my family, friends, stampin' buddies, health and the list goes on. I have been very blessed in my life. Take a minute to say a little "thank you" for all your blessings! Good morning!!! Wow! My stamp camp was November 3rd, and I just now got pictures taken!! I am a little behind!! haha!! Anyway, we made these card portfolios with four cards inside. This would make a wonderful gift for anyone!!! These are made from Certainly Celery Cardstock. I used my Accucut to make the boxes. The ribbon is the Purely Pomegranate satin ribbon--it is absolutely beautiful!! AND, on November 23, it goes on sale--buy one, get one FREE!!! It also includes the Chocolate Satin Ribbon! The ovals are Purely Pomegranate and Very Vanilla. The sentiment is from the "All Holidays" stamp set. Here are the cards we made to go inside. I used my favorite stamp set "Baroque Motifs". 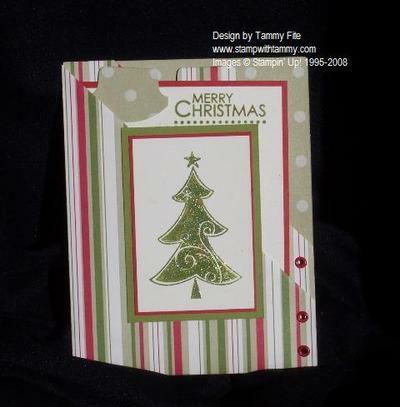 I used Purely Pomegranate and Certainly Celery ink and cardstock.